It was sometime after midnight, after playing Rage for a few hours, that I realized I was hooked. I had intended to play for just a few moments to see how it looked, then really dig in through the next days. Six hours later, as my eyes began to blur, I grudgingly set the controller down to sleep, perchance to dream of a bunch of mutants charging me. Rage is an amazing game with flashes of brilliance. Not everything it does is original, and there are a few things that will leave fans wanting, but there are very few problems with the game, either technically or in terms of design. It is a well-executed game from start to finish. The multiplayer is a bit meh, but in general it is an excellent game. And what else would you expect from id Software? After all, they invented the first-person shooter. It’s a proven fact (and by proven fact, I mean extremely contentious statement that I choose to believe for the sake of this review). If there is one thing that all of id’s games have in common, it is that they are well polished, and Rage is no different. Not everyone is going to want to make sweet love to Rage, and that is fair. The game is a slow burn, and if story is key to you, it will be a long time into the game — upwards of 10 hours or more — before you actually begin to understand the world, the various players and where you fit in. Even then, it is several more hours before the overall plot takes hold. And then there is the climax, which is underwhelming. The same slow burn approach is true for the gameplay. The vehicle combat — of which there is a lot — is fun, and while the FPS side is always entertaining, it won’t be until much later in the game until you really feel like you get what id is doing. Rage is not a game for the impatient, or for those who demand instant gratification. But for gamers that have the time and the patience, they can expect to be rewarded with one of the best games of the year. It began with a cunning plan. An asteroid was on a collision course for Earth, and apparently Bruce Willis and his foul-mouthed-but-loveable band of miscreants weren’t available to take care of things. The Earth was doomed, so plans were made to take some of the best and brightest that society had to offer, then put them in cryogenic sleep, to be revived at a certain date and take charge of the survivors to rebuild society. And it almost worked. Naturally, things went wrong. You awaken, the only survivor of your ark, to discover that the world is fragmented. A new race of mutants have emerged, and humanity is clinging together in small groups and loose-knit towns. A group of technologically advanced, and slightly sinister people called the Authority is after all ark survivors, including you. That soon soon finds you aligned with the resistance, who are looking to stop the Authority and possibly stop the mutant strain for good. The primary story of Rage is actually a fairly small part of the game. The bulk of your time will be spent completing objectives to make the lives better for those around you. These missions help with the immersive nature of the game, but don’t tell you much about the plot. In terms of story, Rage stumbles a bit for the first few hours. The missions and gameplay are fun, but it’s hours before you really get a sense of what is going on. Starting as an empty shell of a character makes sense; it allows you to better integrate yourself into the setting, but it is also a bit odd that your character has no motivating factor to go forth and kill dozens of enemies, beyond the fact that some fat guy that sounds like John Goodman (who voices the character) tells you that they are evil. The story does pick up eventually. By the time it does, you will be deep into the game and hooked, thanks to the gameplay, but the story remains secondary throughout the early sections. The overall conclusion is a bit of a letdown as well, which just reinforces that the story was never the primary focus. Instead, you are left to be immersed in the world. And that isn’t a bad thing. One thing about Rage that may turn people off is the post-apocalyptic, desert-like setting. This type of bleak future world is a favorite of developers. Dozens of games feature it as a setting, including a handful this year alone. 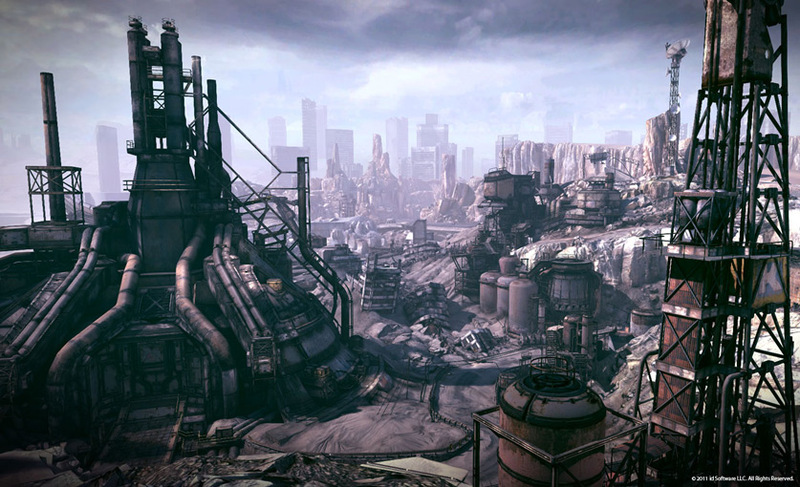 That being said, never has a barren wasteland looked as good as it does on the console version of Rage. When it comes to PC, Rage is gorgeous. When it comes to the consoles, Rage is the best-looking game out there. Period. There will doubtless be some disagreement on that, but the graphics, thanks to the brand new idTech 5 engine are stunning. At first, it isn’t quite apparent what you are seeing. There is an incredible amount of detail everywhere, but the early sections are meant to be barren wasteland. This is something of a setup. As you progress into the game and explore other locations, you will be continually stunned with the new locations that you come across. Whether it be a cave with stalagmites shimmering in a stream of light, an underground town, or a dead city, the game is amazing to see. Every inch of Rage is covered in detail, from the grit on the dirt roads, to the rust on metal walls. This is the technical achievement id is known for. The screenshots don’t do it justice. The audio is also amazing, minus a few hiccups. I experienced a few technical issues where the sound would lag and be off. These were generally very few and far between, but it meant that sometimes enemies would pop off several close-range shots before you even heard the gunfire. But that is nitpicking. Where the audio excels is in the ambient sound. Things like bugs and the wind are a constant presence, and the voices of enemies will trail off realistically as they move. The recorded dialog for enemies is even fairly solid, and you won’t constantly hear “there he is,” or “get him!” over and over again. You’ll hear some repetition in the background dialog, but not as much as other games. The missions do get a bit repetitive. They all typically involve you going deep into enemy territory, murdering everyone you meet along the way in the name of justice, or freedom, or something, then grabbing an item. Sometimes you will need to survive a wave of enemies, sometimes you will need to beat a boss to get out. Yet each area feels unique, and even when you return to areas multiple times, there is always more to see. 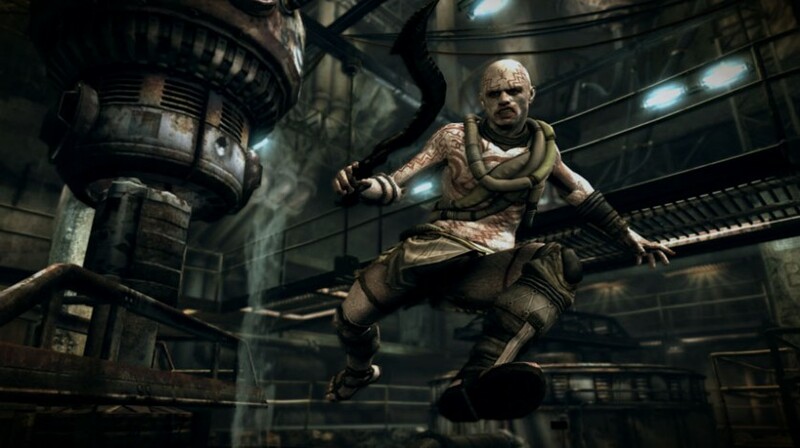 Rage is broken into two distinct types of gameplay: The first-person shooter and the vehicle combat. The vehicle combat is always secondary, but it is a major part of Rage. Travelling between the cities and various locations in Rage could be done on foot, but it would be a timely endeavor. Plus, you would probably get run over by an enemy vehicle, which would ruin your day. With a few exceptions, these driving sections are not mission based, so if you prefer to skip the combat with random enemies, you could always just try to outrun them. But where’s the fun in that? As you are out in the wasteland, you will get into scraps with plenty of fools who are begging to be destroyed. You can oblige them with vehicles, which you upgrade thanks to races scattered through the major towns. The races are time based, combat based, or a combination of the two, and they are all fun. Most people will probably keep playing them over and over as they work to pimp their rides, always intending to play “just one more.” Even though they aren’t technically necessary to progress, they are addictive and worth the time. They also add a lot of variety to the game. But the bigger part of Rage is the first-person shooter aspect, and does anyone out there really think that id would drop the ball on the FPS side? Well it hasn’t. Rage is not a simple game. 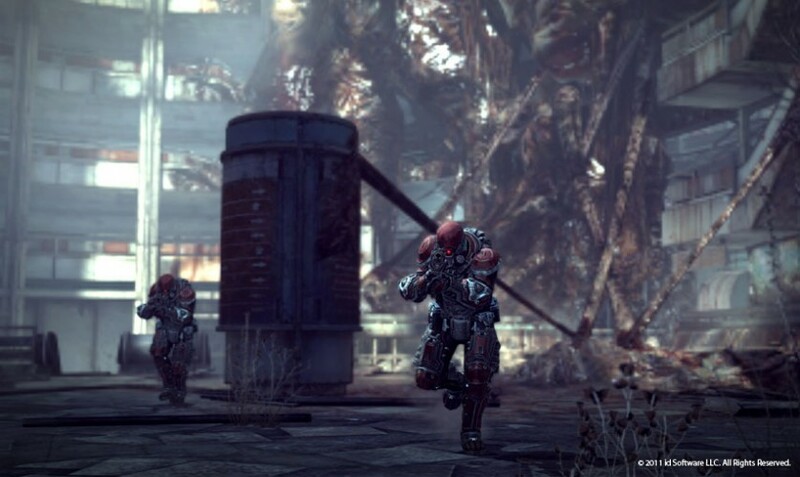 The enemies are tough and frequently armored, and the mutants you face are fast and agile. There is no lock-on function either, so it can be unforgiving. Where the FPS side really shines — even dazzles — is when you get deeper into the game and begin to pick up more and more support tools and better ammo. You will quickly amass a decent-sized arsenal, and each weapon offers multiple types of ammo. Some are powerful explosives, others are just fun (the mind-control bolts are a highlight). There are also several “quickuse” items. Some are support items like bandages, which heal you immediately for when the regenerative health isn’t fast enough, while others are offensive. Of all the weapons in the game, the one that has the best chance of becoming iconic is the wingstick: a three-pronged boomerang with a seeking ability. On un-armored foes, it is an instant kill, and it makes a satisfying hit. As you get deeper into the game and face more difficult enemies, you also will need to think more strategically, and deploy things like the sentry bot, a mechanical spider with a machine gun. Put two of those down with a sentry turret in the middle, and you can hold off wave after wave of enemies. The combat is always fun, but it continues to become more and more deep as you play, and by the end of the game you will approach scenarios in an entirely different way than you would at the start. In a gaming world drowning in a sea of FPS online multiplayers, Rage offers something totally different that feels fresh. For about an afternoon. 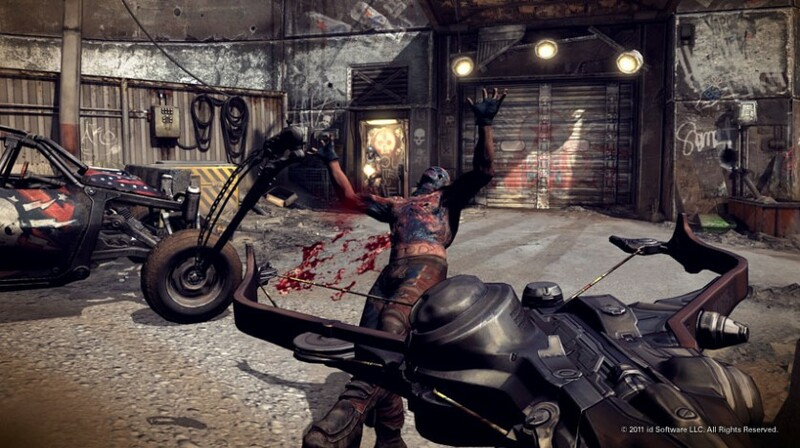 The Rage multiplayer consists of two sections: Road Rage and Legends. Of the two, the Road Rage is the bigger focus. Rather than offering an online FPS, Road Rage is entirely vehicular combat and racing. There are four game modes to choose from, and they all revolve around the idea that you need to be fast and destroy your enemies. The Road Rage section features a progression system that offers new vehicles and weapons as you level up. It doesn’t take long to get to a car you may want, but the early races will be tough as you face off against clearly more powerful and better armed. Once you have died enough to earn some decent equipment, you can then compete against three other players. It moves well, the game modes are entertaining, and there are plenty of maps to choose from. All in all, it should amuse you for a few days, but that’s probably about it. For as fun as the vehicular side is, there just isn’t enough to really keep people interested for long. More game modes and a higher player cap may have helped, but it is an interesting distraction to the campaign. You have to applaud id for trying something new, but it just doesn’t really offer much to hold your attention. 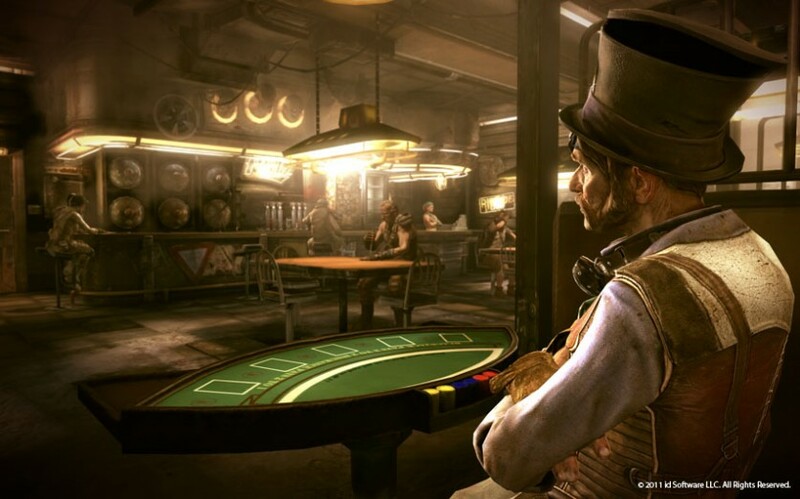 The other multiplayer section, the Legends, is a two player co-op game mode that offers nine episodes from the history of the Wasteland. In each episode you are given a task, but they all boil down to “go forth and kill.” Legends is a good idea, but the nine missions can all be beaten in a few hours at most. There is a point system to seek better scores, but they aren’t enough missions to really be a major part of the game. Despite a few little problems, including a multiplayer that feels like something tacked on and a story that doesn’t live up to the setting, Rage is easily one of the best games of the year so far. 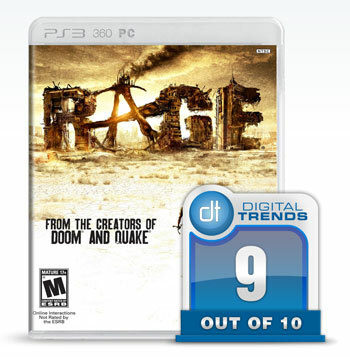 There are plenty of competitors coming in the next few months leading up to Christmas, but Rage has set the bar high. There isn’t a ton of wholly original content in Rage — you have seen most of the mission-types and game play modes before in other games — but id takes those elements and refines them to near perfection. If you have some time to spare — say, 20 or 30 hours minimum — then head on into the wasteland of Rage, and prepare to be blown away.